Karl Marx revolutionised the world through radical thought, communistic ideals, and slapstick comedy. 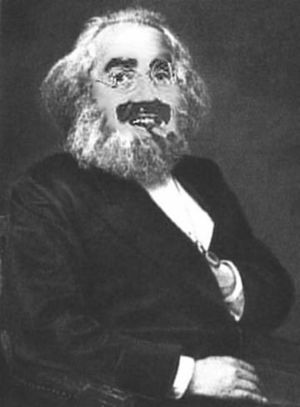 Opiate of the Molasses was the Marx brothers first hit movie, starring Karl Marx and his brothers Lenny, Joey, and Trotsky. After dismal box office showings with such movies as Communist Man-o-Pesto and Proletariat Soup, Molasses was just the thing needed to propel the Marx brothers into fame. Karl plays Jiminy T. Cricket, the professor of an economics class in the fictitious country of Russia. However, when Karl is sued by a student (played by Zsa Zsa Gabor) for sexual harassment, he is banished to London. In the time before Karl must leave, hilarity an chaos ensues as students argue over who will realize Karl's dream of a classless society. Joey and Trotsky play two students at the top of the class who yearn to take control of the classroom in Karl's absence. Lenny is, as usual, silent, because in all 12 Marx brothers movies he is dead. Frederich Engels makes a cameo as "Janitor #2". Karl to Lenny: "Is that a bourgeoisie wallet in your pants, or are ya just happy to see me?" Karl to camera as his students fights over who put a cherry bomb in the bathroom: Now that's what I call a class struggle! Karl to a student: "Guess what you and capitalism have in common? You're both going to fail!" Karl to Zsa Zsa: "You have nothing to lose but your chains... and your virginity!" Joey to Trotsky: "I heard that Mexico's real nice this time of year!" Due to the anti-capitalist leanings of most of the production and distribution staff, the film made almost no money at all, despite having ticket sales of over 3.5 million. The film almost bankrupted the AOL/Time/Weber Studios and only just grossed enough to cover production costs. Despite this, the film was well received and was given a positive 87% rating on RottenTomatoes. Surprisingly, the film's mixture of wry social satire, one-liners and slapstick comedy was a huge hit in the People's Republic of China, where it earned Chairman Mao Tse-Tung's personal seal of approval and even garnered a mention in his "Little Red Book". Whilst the film was loved by the critics and viewing public alike, it also had a huge impact on the academic world. Indeed, the film is now considered madatory viewing on syllabuses for degrees in political science the world over and is thoroughly endorsed by the faculties of Oxford University and the school of Hardvard knocks to name just a few. This page was last edited on 16 April 2010, at 02:28.